With the issue of these recommendations, which have the character of a standard, the "Building Excavations" working group of the German Geotechnics Association (DGGT) aims to provide assistance with the design and structural calculation of excavation support works. The introduction of the Eurocodes for building control purposes made necessary a revision of the previous edition of the recommendations to comply with the requirements of DIN EN 1997-1:2009 together with the national annex DIN 1997-1/NA:2010-12 and the supplementary regulations of DIN 1054:2010-12. All recommendations were thoroughly checked, revised where necessary and adapted to new knowledge. 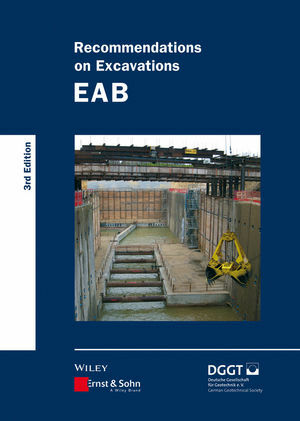 Chapter 10 "Building excavations in water" was substantially revised. Due to the progress of development of measurement instruments and the more stringent requirements, Chapter 14 "Instrumentation for the monitoring and supervision of building excavation support works" was formulated completely anew. - to improve the cost-effectiveness of excavation support works. The working group 2.4 "Building Excavations" in the technical group "Earthworks and Foundation Engineering" of the German Geotechnics Association, Essen (DGGT), under the leadership of the chairman Prof. Dr.-Ing. A. Hettler, work on a voluntary basis.